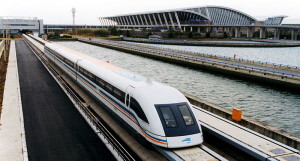 The futuristic train is about to be built by Georgia-based American Maglev Technology. The 250-mph magnet-propelled train will move on a cushion of air and the ride will be smooth and noiseless with no rattle of wheels. The green technology system uses lightweight cars gliding one centimeter above a steel rail through powerful magnet forces. Such systems are already operating efficiently in Japan, China and South Korea. The company is expected to break the ground this fall and the line will be operational by 2017. The first phase, a 13, 8-mile elevated track, will be constructed at cost of $300 million. The floating train is anticipated to carry up to 4, 1 million passengers a year at an average fare of $10. However, there still are many questions that need to be considered. One of them is how the magnetically levitated train might work with the $1, 2 billion Sun Rail commuter train. And what to expect in the future? The time of flying cars may be closer than you think.